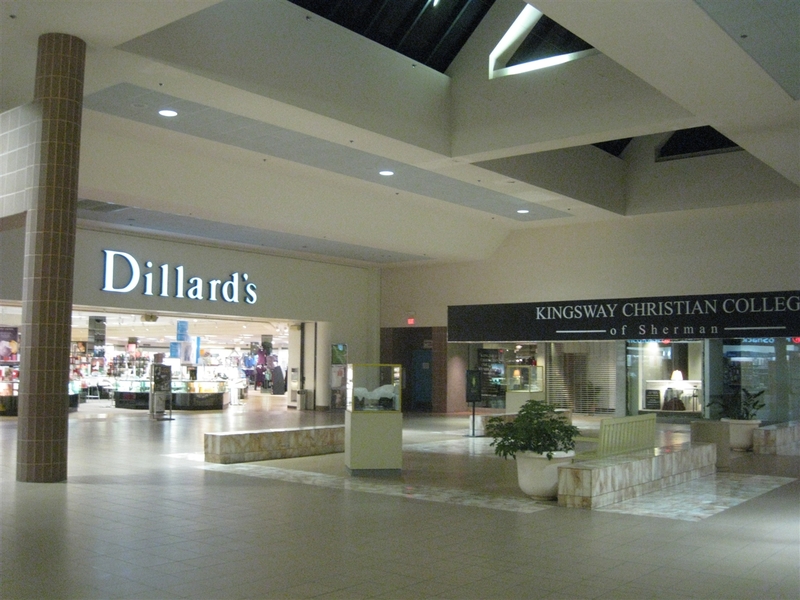 Midway Mall, located in Sherman, Texas, is the only major shopping mall for a section of Texoma comprised of the cities Sherman and Denison, Texas, and Durant, Oklahoma. 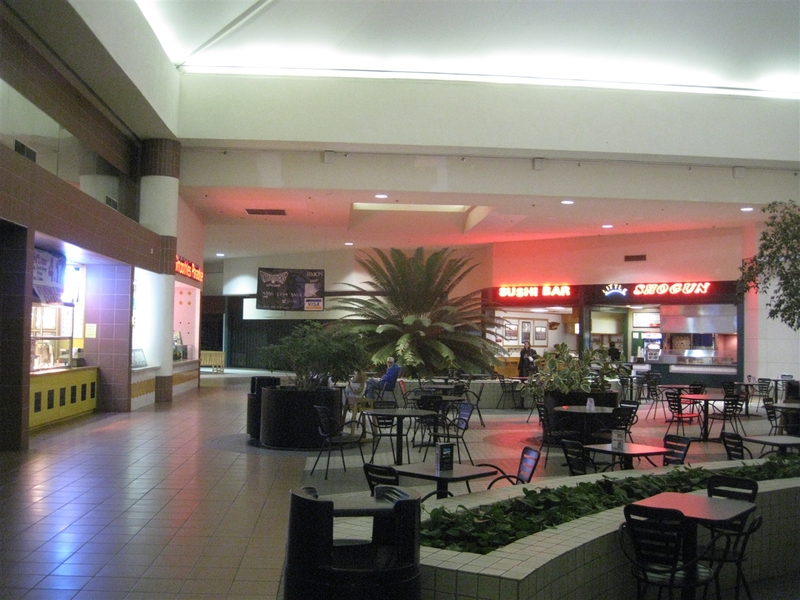 With a population of about 150,000, Midway Mall’s trade area is located approximately 70 miles northeast of downtown Dallas; however, the mall itself as well as the Texas side of its trade area are technically located within the behemoth Dallas-Fort Worth Metropolitan Area. With that said, the nearest of Dallas-Fort Worth’s malls are over an hour away, which should make Midway Mall a tier ‘A’ mall and successful, especially considering its size at 600,000 square feet with three anchors and several junior anchors. 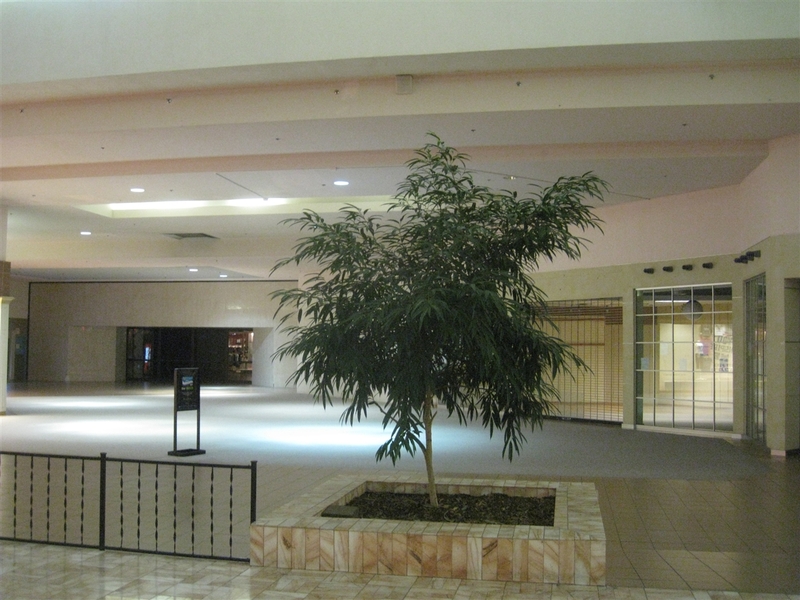 However, this is not the case; Midway Mall is currently challenged by an alarming and rapidly increasing vacancy rate. But why is this? 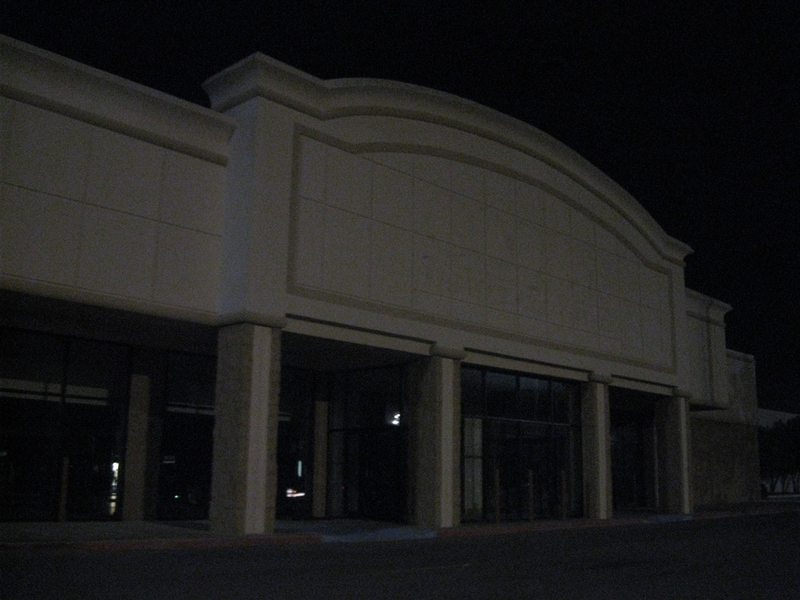 The faltering probably isn’t due to the mall’s location. 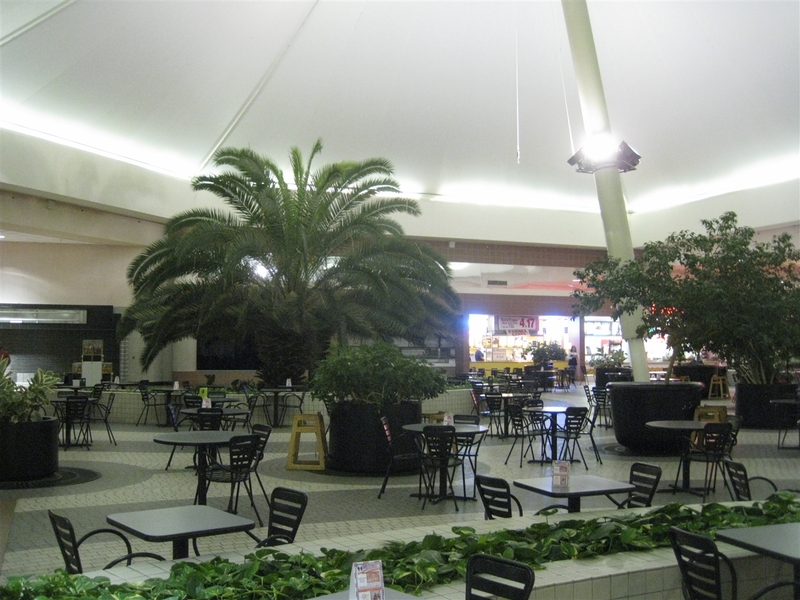 Midway Mall’s location is ideal, situated on Texoma Parkway smack dab in between the cities of Sherman and Denison, and only half an hour from Durant, Okla. as well as the booming sprawlburg of McKinney. 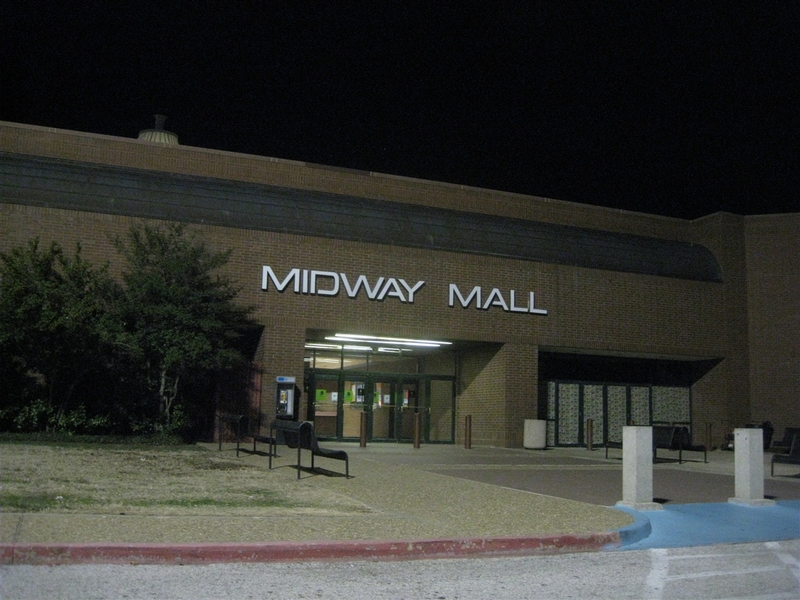 In addition to being located in between all the population centers in its trade area, Midway Mall is also adjacent to US 75, a major north-south freeway connecting Dallas and its suburbs to Oklahoma and points north. Also nearby is Sherman Town Center, located along US 75, featuring Wal Mart, Target, Home Depot, and 30 other stores, as well as a JCPenney which relocated from Midway Mall in 2007. Recent problems may have also arisen due to competition. Although Sherman and Denison are some 70 miles north of downtown Dallas, the suburbs of Dallas-Fort Worth start in McKinney, which is just 30 miles south of Sherman. Although McKinney doesn’t have a traditional mall of its own, per se, it has nearly every store under the sun along the US 75 corridor, including many upscale options. In addition, several of the DFW Metroplex’s best malls are in Plano, Frisco, and north Dallas, and they are all approximately an hour away from Sherman and Denison. 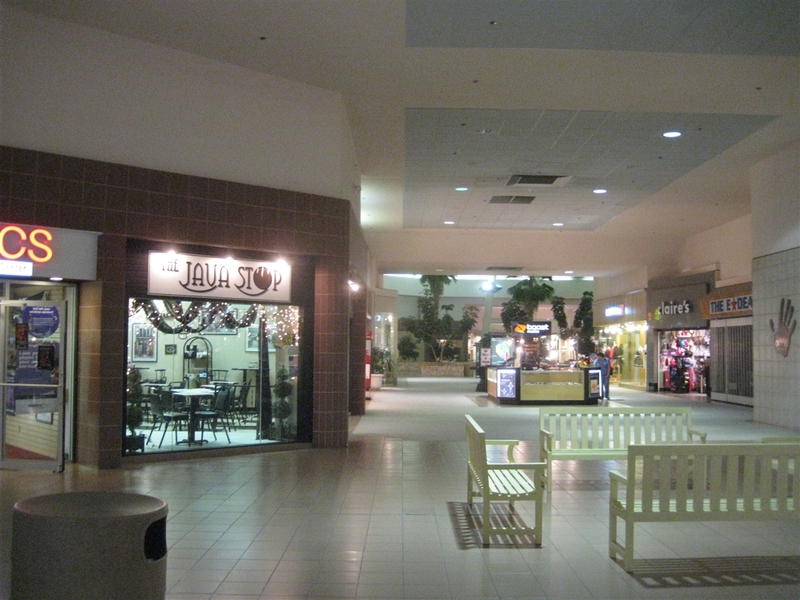 Also, Sherman’s own Sherman Town Center, an outdoor strip mall, appears to have more retail activity than Midway Mall, and in 2007 the Town Center stole the mall’s JCPenney. Whoops. Ironically, competition somewhat recently favored Midway Mall, as it opened directly up the road from another mall, the Sher-Den Mall. Sher-Den Mall opened during the 1960s, which was anchored by Montgomery Ward and JCPenney (anything else?). 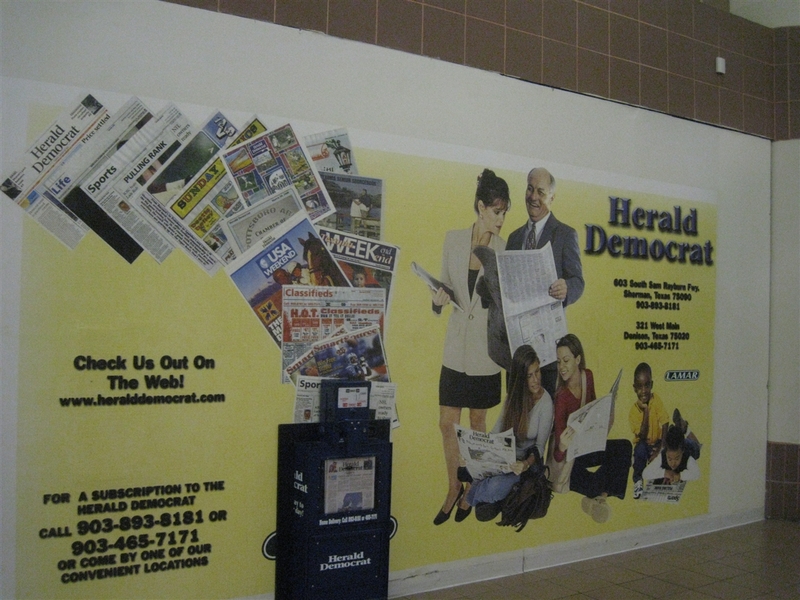 Despite extensive renovations in the 1980s to compete with the larger Midway Mall, Sher-Den Mall closed with a whimper when Montgomery Ward went bankrupt and closed in 2001; it was torn down in 2004. 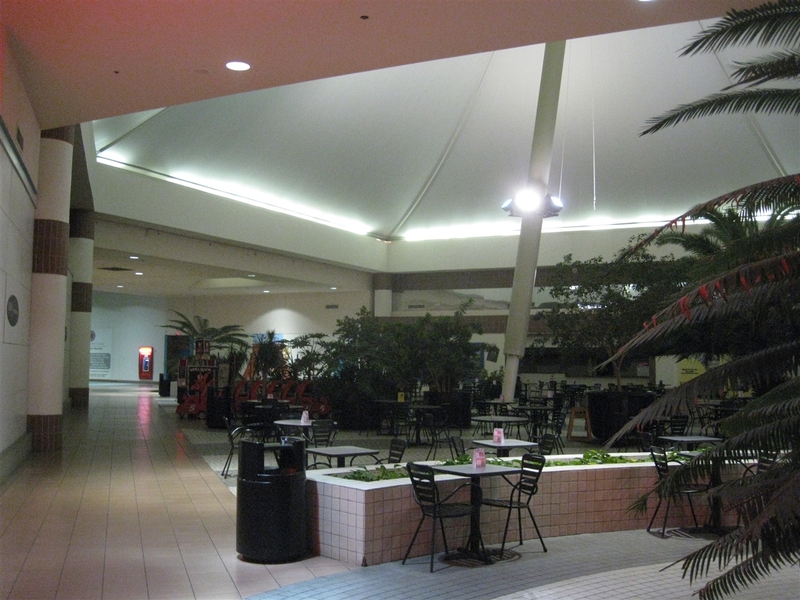 Perhaps the most telling statement of trouble is the condition of Midway Mall, which is amazingly dated in terms of decor and atmosphere. 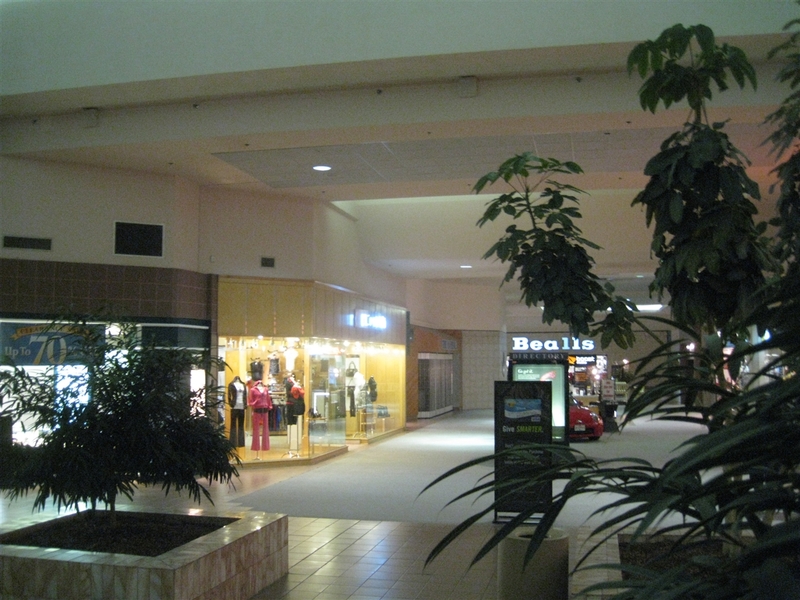 The entire one-level mall can best be described as cavernous, and the dimly lit corridors suggest slumber rather than the brightly-lit exuberance found in most modern, successful shopping centers. 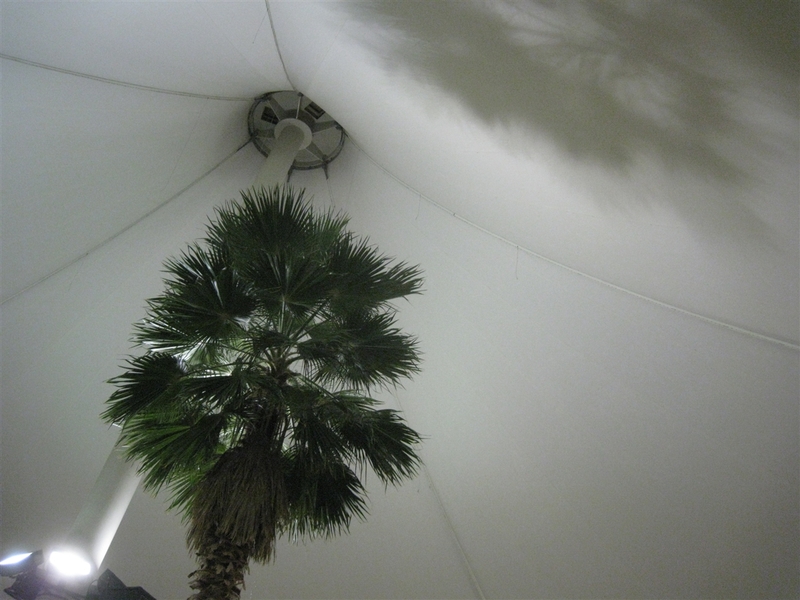 Perhaps not utilitarian nor functional by modern standards, the mall’s corridors do evoke a certain sense of the past, with bland carpeting, giant palm trees, sterile marble planters and three circus-like tents which puff up some 50 feet toward the sky at three spots/courts throughout the mall, and are a sight to see. 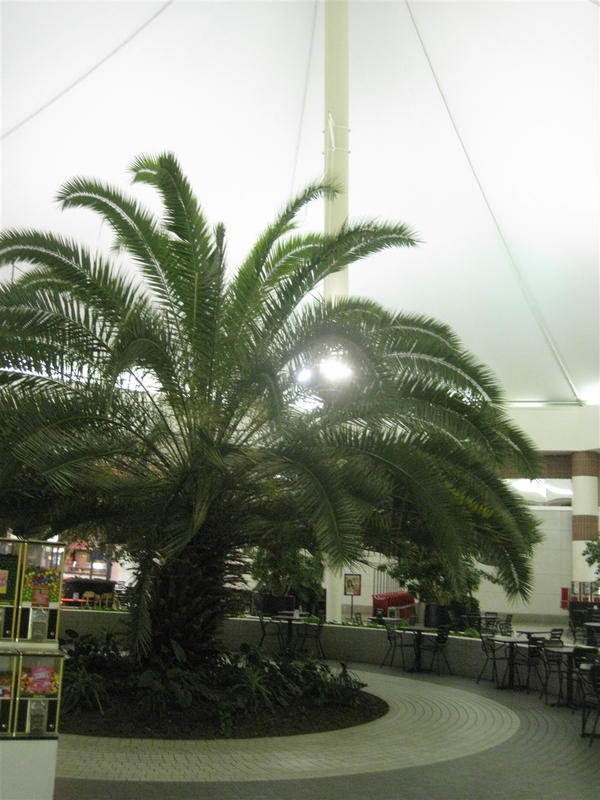 So, too, are the mall’s maze-like corridors, which zig and zag and even double back on each other, and the nearly empty food court. 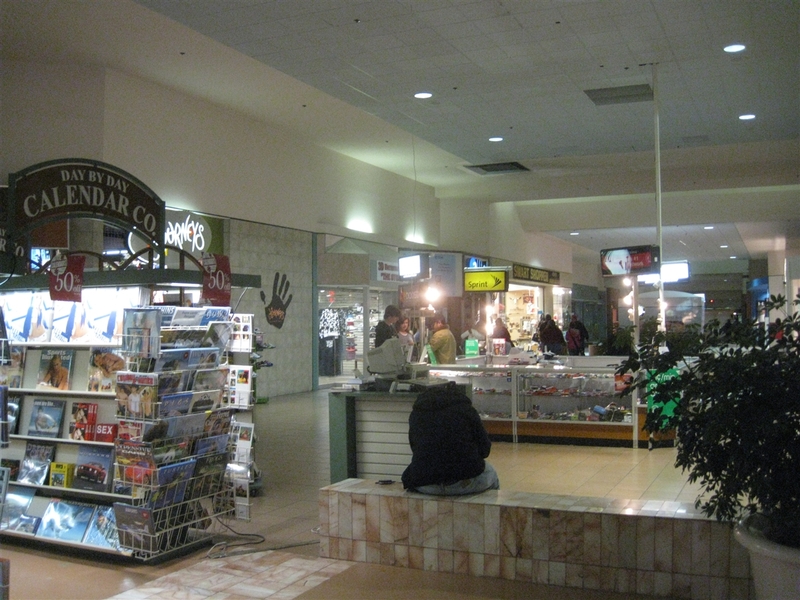 Since there are few shoppers, there are fewer kiosks, too, and frequently lots of open space throughout the mall. 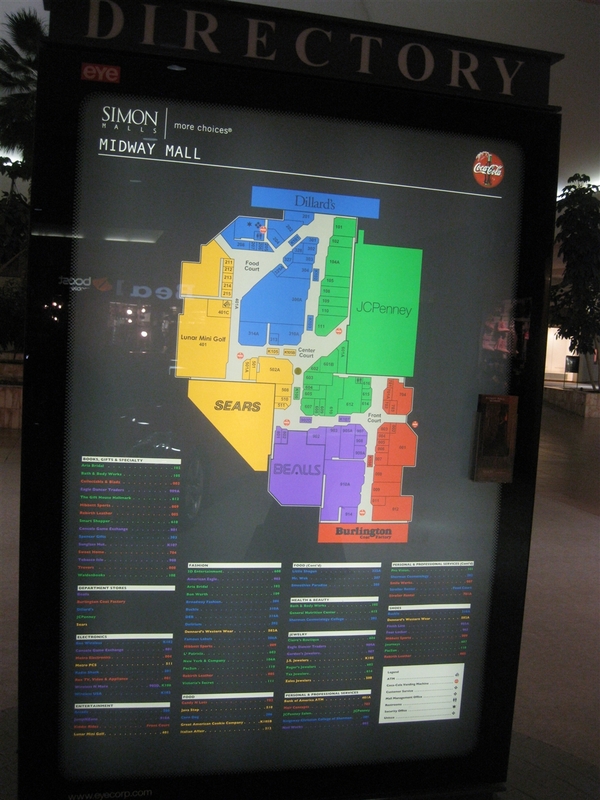 We visited Midway Mall on a recent Monday night and discovered that the mall’s online directory was way out of date, having missed the departures of Mervyns, JCPenney, Goody’s, the movie theatre, and probably some in-line stores as well. 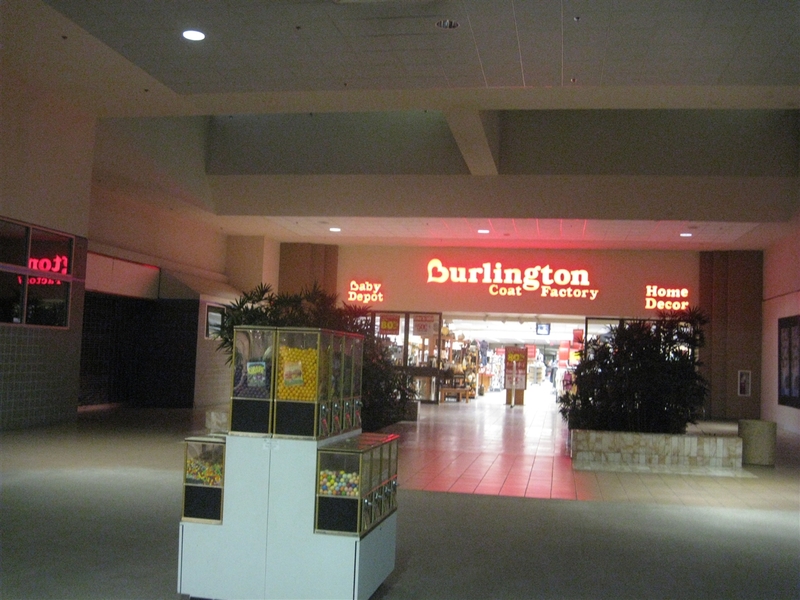 Bealls, Dillard’s, and Sears remain, and Mervyn’s has been replaced by Burlington Coat Factory. 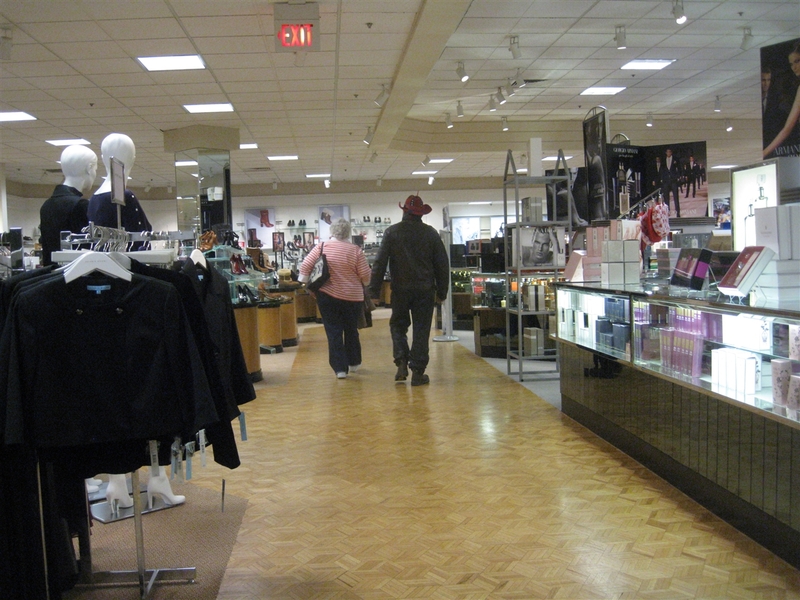 JCPenney moved to nearby Sherman Town Center in 2007, and Mervyn’s and Goody’s exited the market only to close outright some time later. 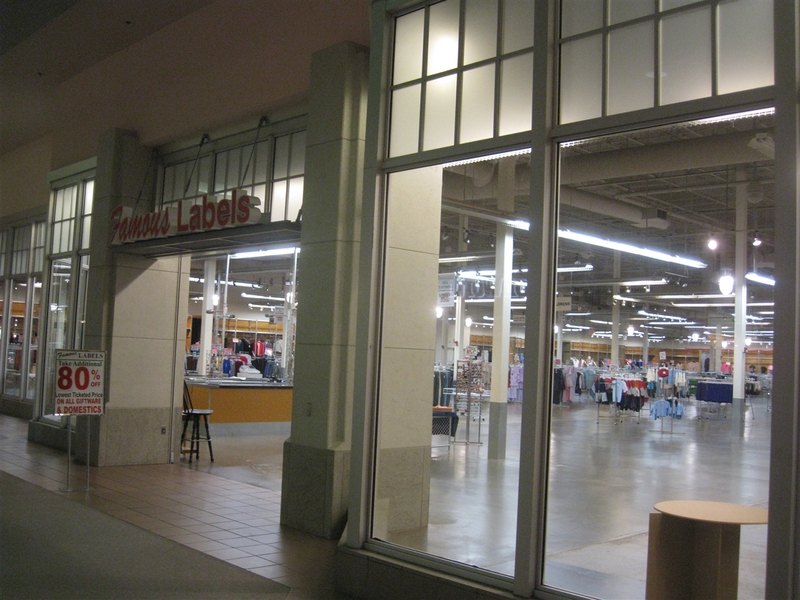 Also, junior anchor Famous Labels has taken what was obviously an Old Navy space, and the mall was so dark and drab. There weren’t many shoppers, either, and the fact that the Day By Day Calendar Company kiosk boy was spaced out and listening to headphones while sitting on a nearby planter is probably telling as well (see pictures). Did we mention how dark it was? 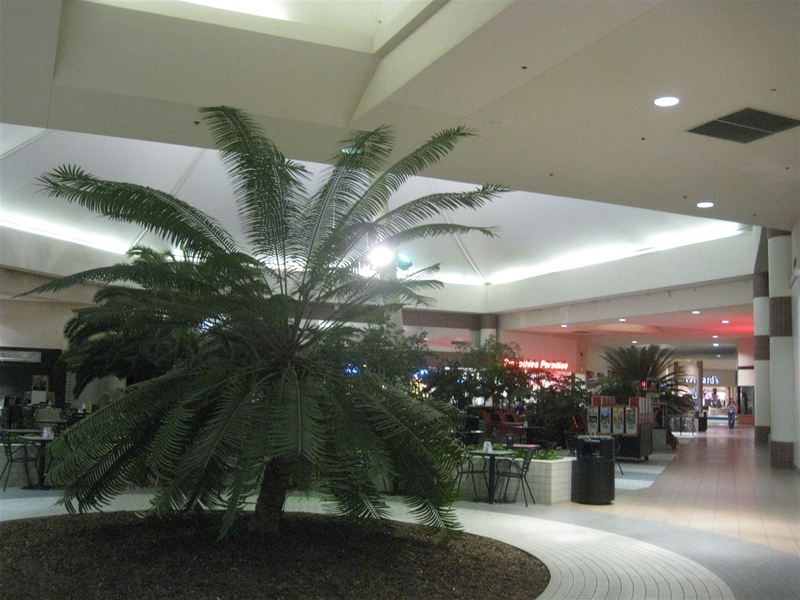 Midway Mall is a dim, dank, outdated mall with an amazing layout. 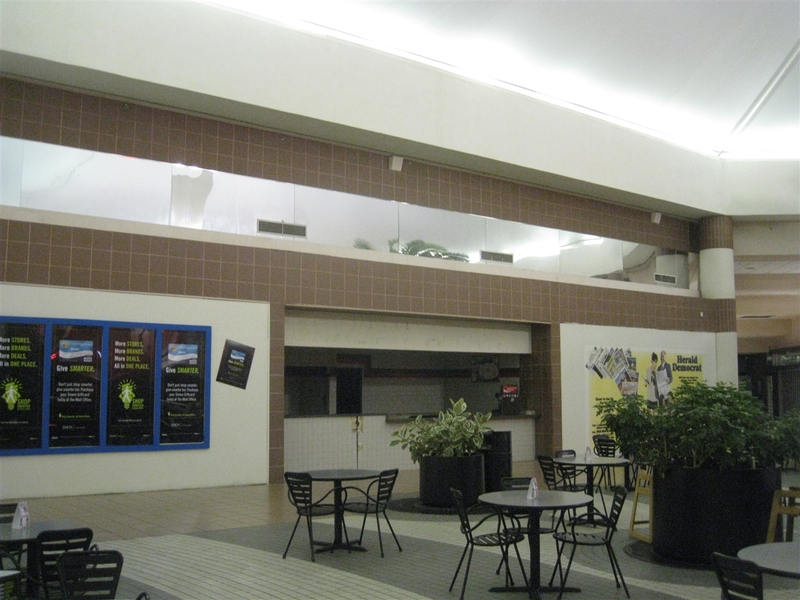 We were shocked at not only the mall’s condition, but at the alarming rate of vacancies; we expected this to be a much more typical, modern successful mall and not a cavernous maze. Being retail historians, we of course found this to our liking, but we feel kind of bad for the citizens of Sherman, Denison, and Texoma. We’d like to think they could use this; their population supports it, but it must be choosing to drive down to Dallas and its suburbs or to the outdoor strip centers rather than to patronize – or at least update – this mall. We’ll put it on deathwatch for now and keep our eyes peeled. In Texas, an hour’s drive is no big deal. Proximity to DFW and the local presence of big boxes mean that this place should have died years ago. I think there’s also a large, not entirely healthy outlet mall due East on the interstate to Ardmore which probably doesn’t help either. 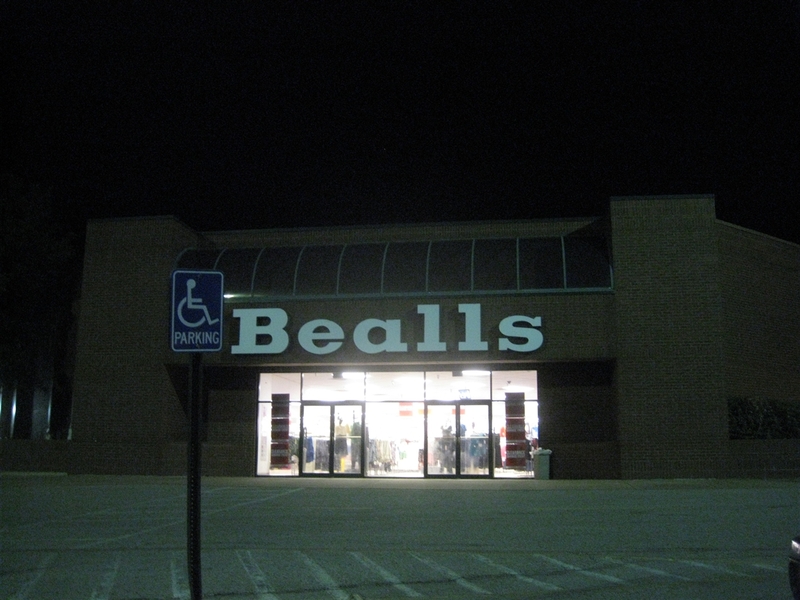 Unusual floorplan + dated yet sterile layout + low ceilings + Texas that I didn’t submit + wrong Bealls logo = priceless. 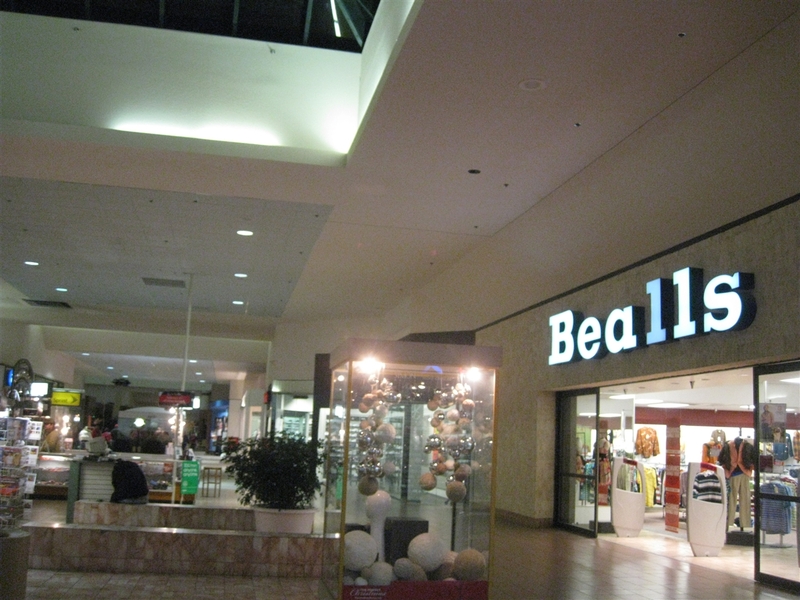 Seriously, the Bealls logo on the directory is Bealls Florida, which is not connected with the Bealls Texas in any way. 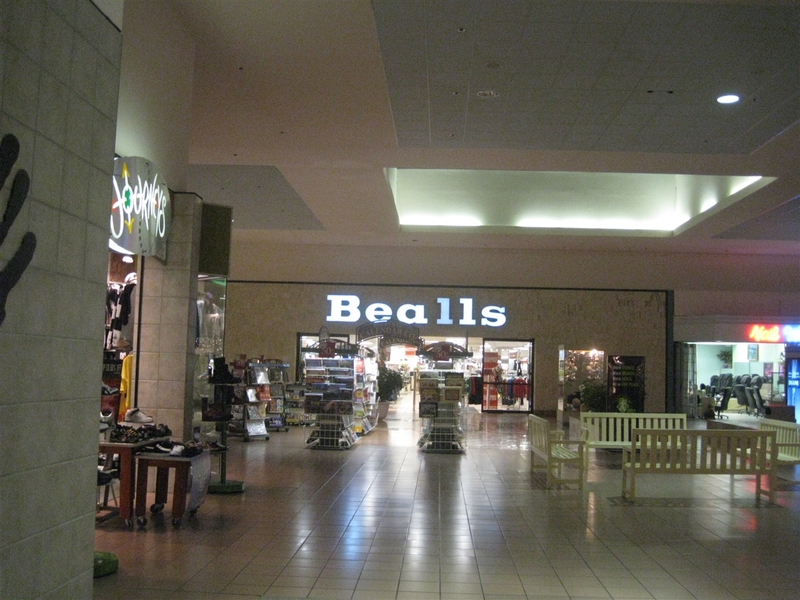 See, Bealls in Florida has Bealls Outlet, which is Burke’s Outlet everywhere else. 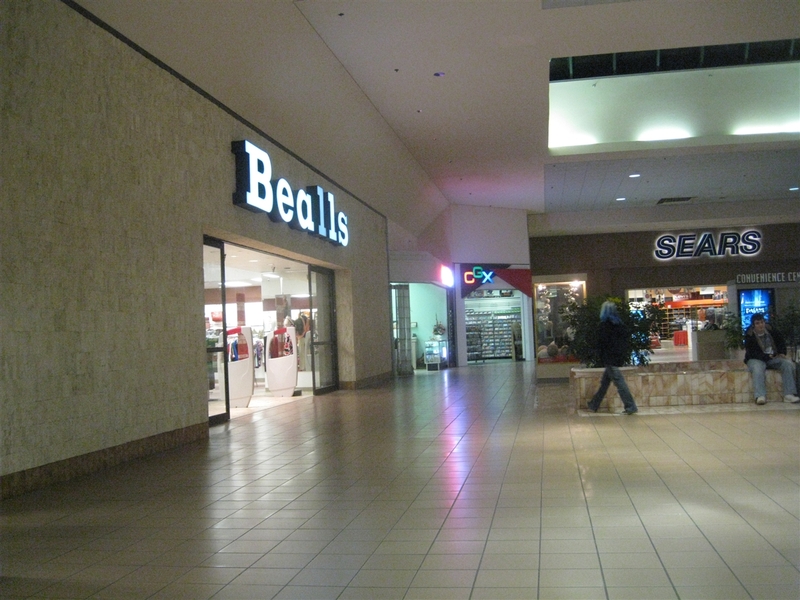 For Bealls Texas not in Texas, it’s Stage. My suggestion is to put up fresh coat of paint, new signage, and add some stores with an outlet format on to regular stores already located here. If it can be affordable, give a renovation. 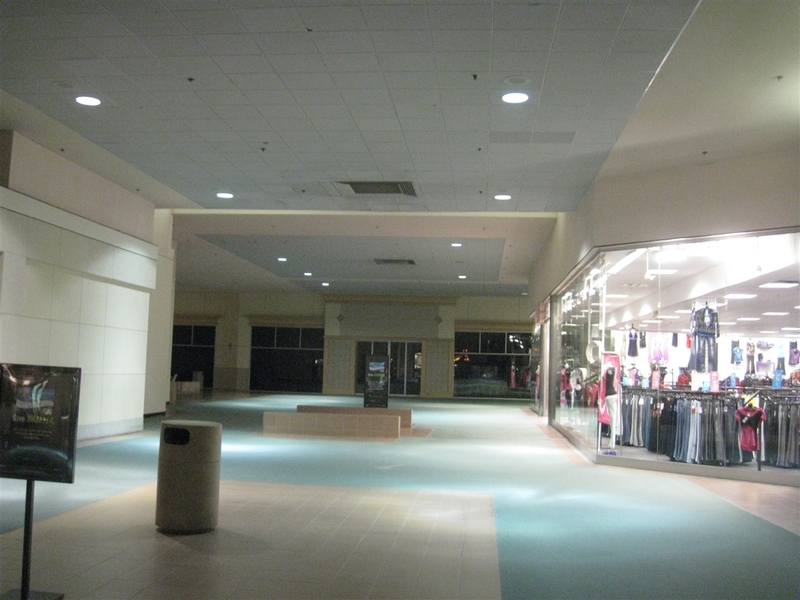 I believe that this mall would thrive if it was more clean, and bright on the inside and out. 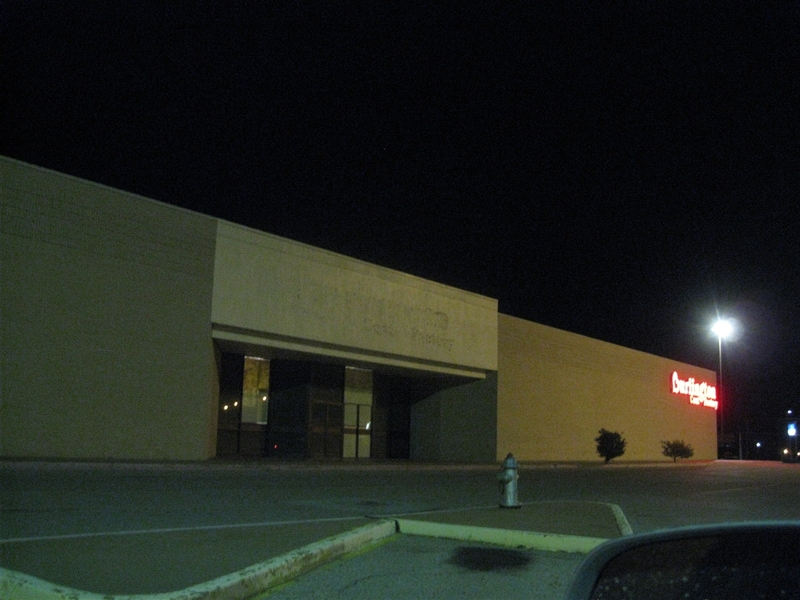 It was Sher-Den Mall and was anchored by (at least) Wards and JC Penney. So that Penney’s has now moved twice! 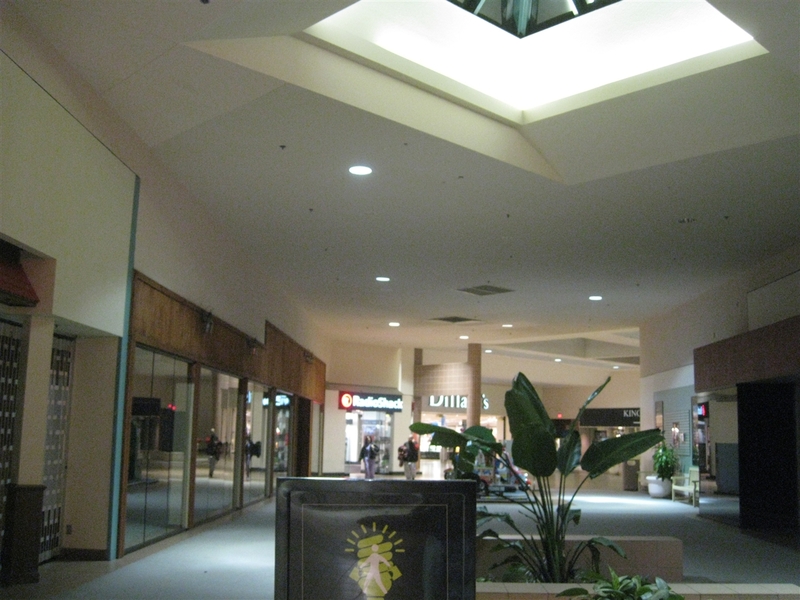 Where is is located in Sherman Town Center? 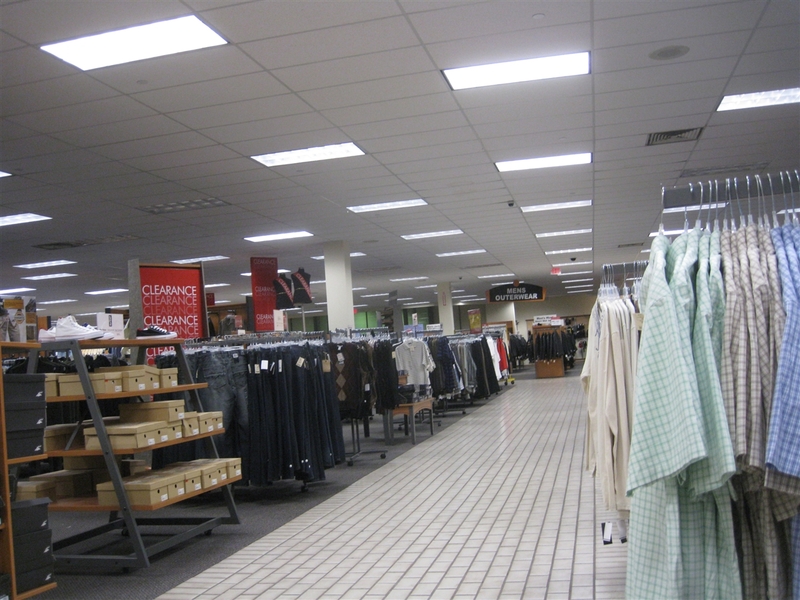 @AceJay, J.C> Penneys in Sherman is a stand alone box in Sherman Towne Center. Here are some more photos of Sher-Den Mall. Wow!, AceJay! That’s some find! Thanks so much! I put that link right in my “Vintage Retail” bookmark folder! 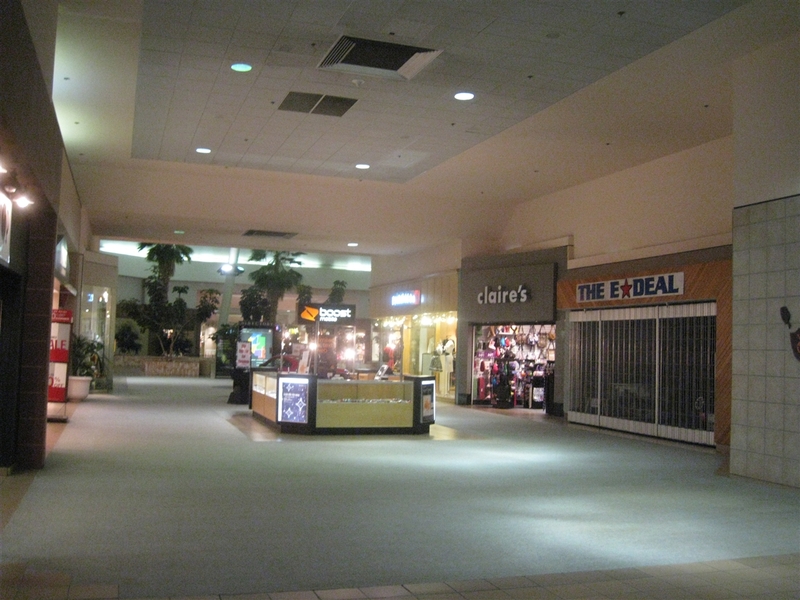 Sherman is simply not a lively place, so it’s no surprise the mall isn’t very popular. 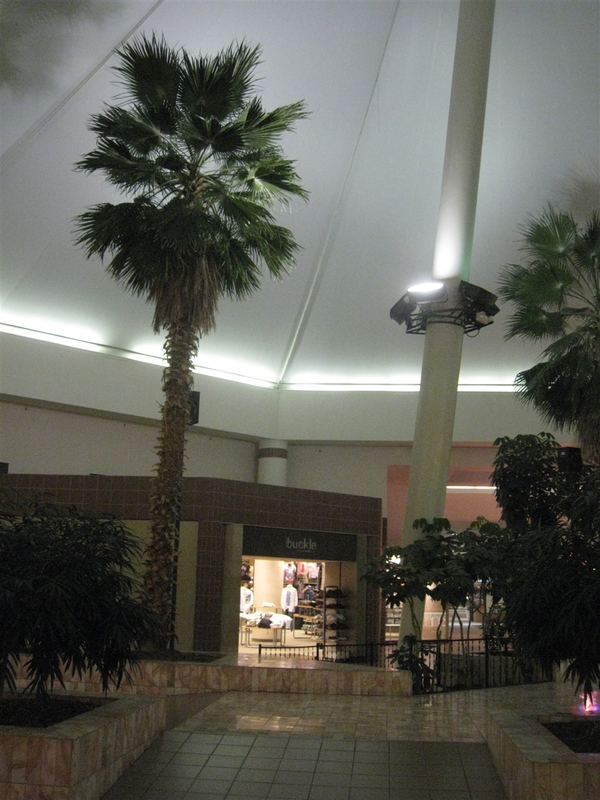 Just thought I would say the exterior of this mall looks very much like Hot Springs Mall in Hot Springs,Arkansas exterior.Hot Springs mall opened in 1982. I know that for a fact. 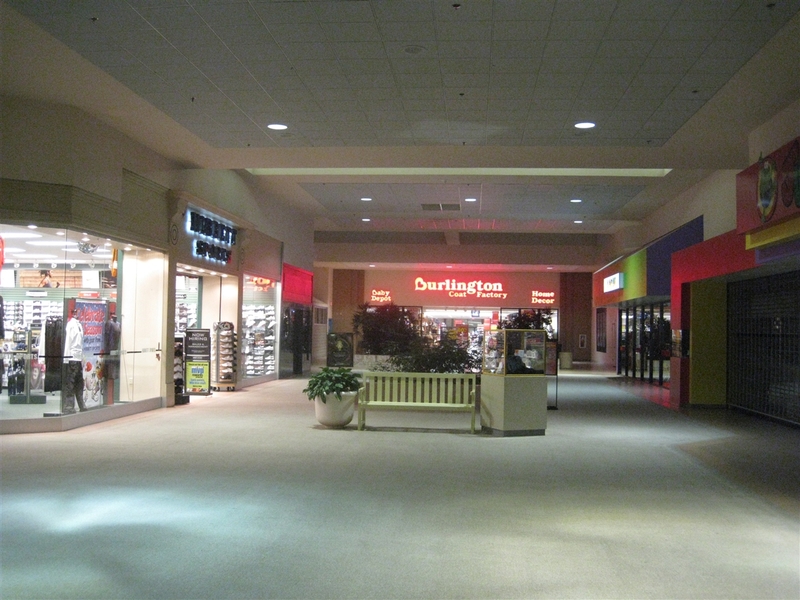 @Dustin, I agree, although this mall has a much more interesting interior. For New Englanders looking at this, does the inside of this mall remind you of a very large version of the Bristol Centre Mall? This mall is very interesting. 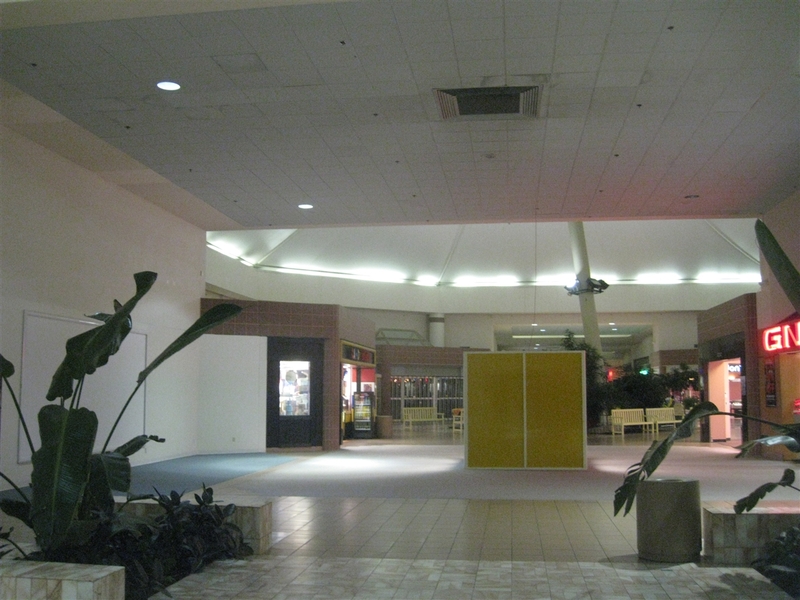 Especially because of its layout, and airy ceilings that remind me of pics I’d seen of the now dead Eastland Mall in Tulsa. Am I right in suspecting the part of the mall that’s shaped like the number 4(and inbetween Sears, JCPenney, and Dillards) was added later on in Midway Mall’s history, and wasn’t original to when this mall was first constructed? 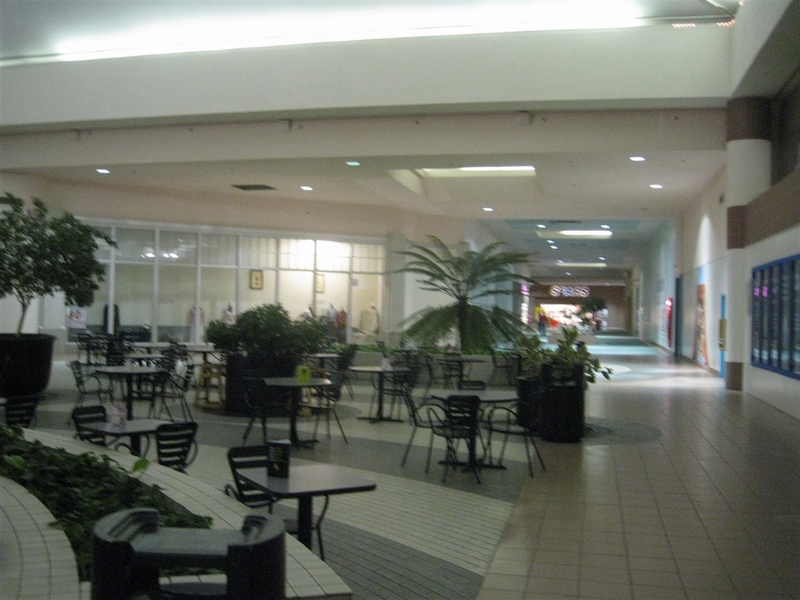 I have a hard time telling if that portion was added on later to this mall or not, since that portion surprisingly doesn’t look too different(at least at first glance of these pics) than the part of the mall inbetween Burlington Coat Factory, JCPenney, Bealls, and Sears. 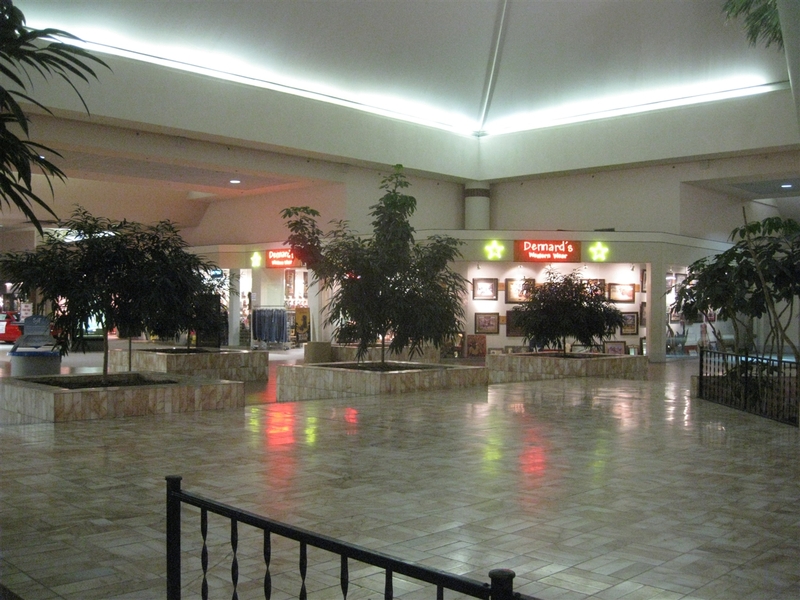 Also, thanks to AceJay for posting a link to the history of Sher-Den Mall. I found that extremely fascinating, and it would be a shame if this mall suffers the same fate as Sher-Den Mall. I think a little interior and exterior renovation, and possibly either redesigning this mall’s layout(such as eliminating the weird ‘4’ portion of this mall), or shrinking down its size could give it a needed boost whenever the national economy rebounds again. Ha, I probably should work for Simon(or another mall developer/REIT), considering my natural interest in reading about malls like this! 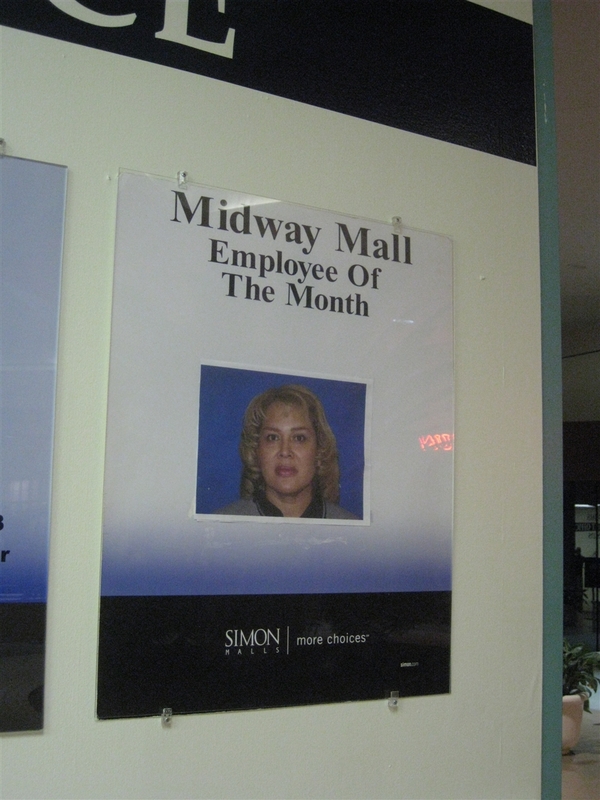 My mom and I went to Midway every Saturday, when my daughter was born she joined us. We started dwindling our shopping sprees when the restaurants and cinema left. When the air conditioning didn’t work well we went even less. We finally just quit going a few years ago. My 14 year old prefers going to Frisco. We are from Durant, OK and there’s nothing here but Walmart, fast food and the Indian Casino. I don’t know why we’ve never had a mall or decent cinema. 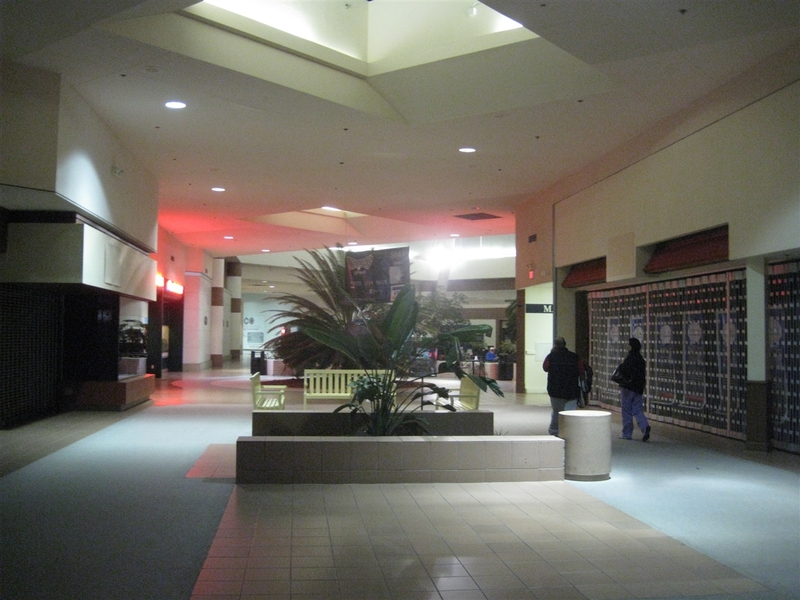 What really hammered the final nail in the coffin for Midway Mall was the Sherman Town Center. Plain and simple. Until 15 years ago or so, US Highway 75 routed directly in front of the property, but since the completion of the Sherman-Denison bypass, most of the major north-south traffic stays a good mile west of this location. 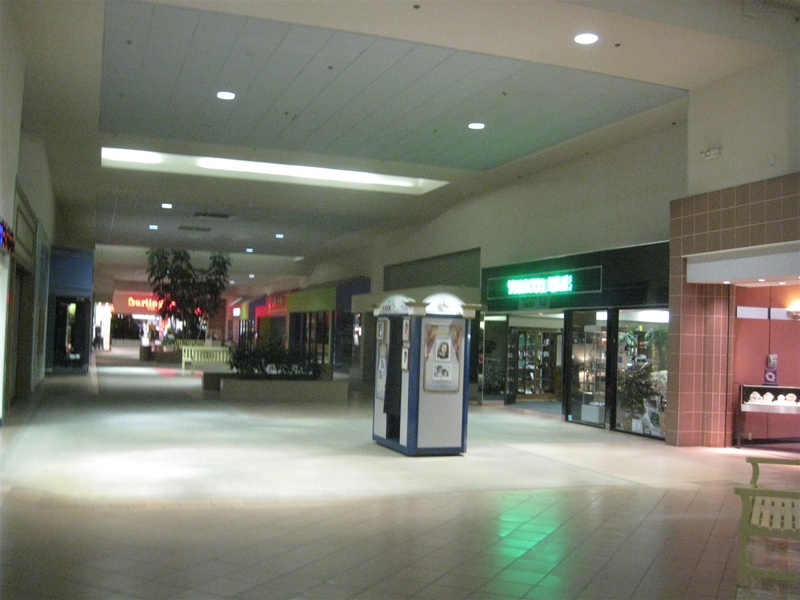 Once the Town Center was completed, it was for all intents and purposes adios Midway Mall. 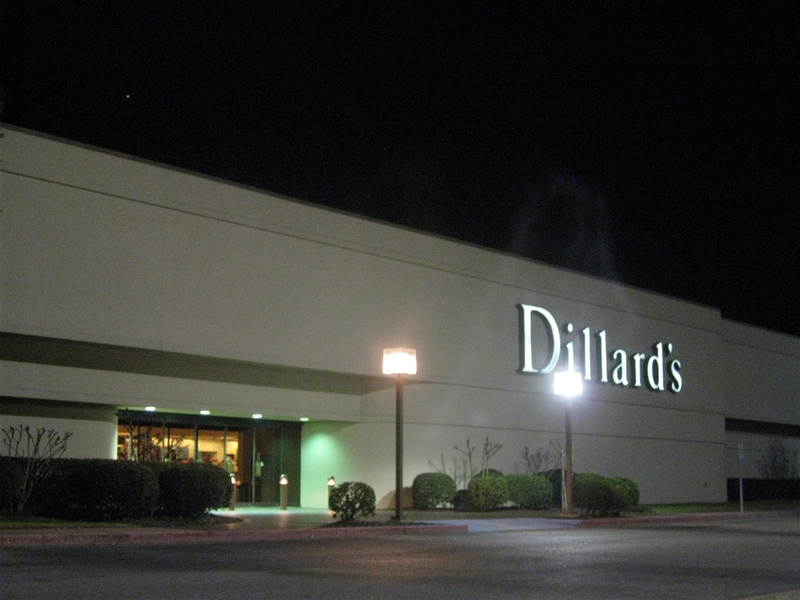 As the article states, there are a few stores wheezing along (namely Dillard’s), but most of the major retailers jumped ship along time ago (supposedly not helped by rent that is still through the roof or the large herd of local tweens and their faux gang-like activities). It’s a shame really. 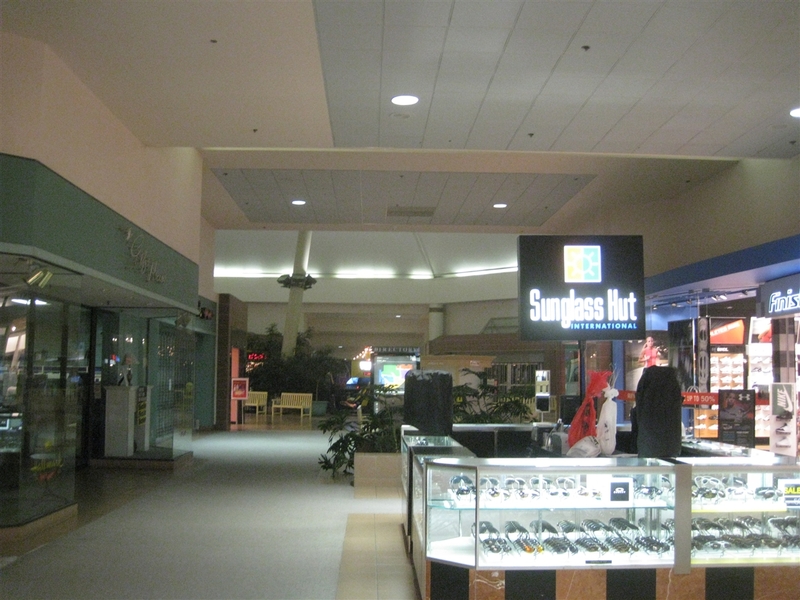 In the mall’s heyday, it offered a wide selection of retail options with the convenience of enclosed shopping, which you don’t get with “modern” aspects of the newer Town Center (and don’t get me started on T.C.’s atrocious traffic flow design/parking layout). Due to the age ol’ adage of “location, location, location,” a fresh coat of paint and spending more coin to turn many of the interior lights back on probably won’t save this one. The new highway 75 opened in 1985. I lived in Gainesville in the late 80s and used to go to both Golden Triangle Mall in Denton and the Midway Mall in Sherman. I believe you are correct that the new 75 opened in 1985…but only the part that bypasses Sherman. If I recall correctly, the Denison part of the bypass was not completed however until a few years later and so most local traffic still used the Texoma Parkway until the 1990’s to travel between the two cities. The retail development on the new 75 was delayed by several years until the entire bypass was completed. I actually didn’t realize that most traffic now goes along the Sherman-Denison bypass, so that changes my thoughts about the likelihood(even lesser odds than I thought) of this mall surviving. Thanks to Jamie for posting what you did, since you’re obviously right about this mall not having much of a chance, if at all, of surviving. Would still appreciate it if someone could answer my questions about what parts of the mall are original to when it was constructed, and which parts/wings were later additions to this mall. @Allan, The whole mall was built at the same time,however where the old JCPenneys was that was the old Sears, they tore down sears and moved it back and built the mall, I dont know who came up with the maze like hallways but I must admit its interesting, I’ve recently heard that the mall was bought out and that possibly another anchor store and a studio movie grill and restraunt and bar are going in there, so we will just have to see. I have lived in this area for almost 2 years and visited this mall for the first time this weekend. Of course, I have been to the Sherman Town Center about a zillion times. 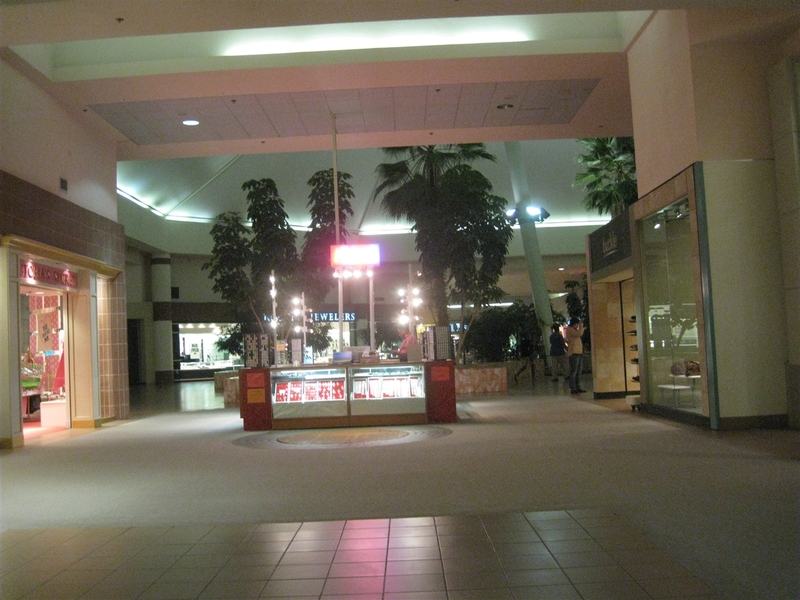 Being a vintage mall fan, I wanted to see it before it went. Your photos make it look nicer than it is. It looks to me like it was ugly even when it was new – what is with all the pink?! And the circus tents? That was the 80s for you I guess. The incomes here are lower than in the Metroplex, and I think people who have greater than average income have been used to just driving South to spend it and don’t spend it up here. I noticed that the mall still has some stores that teens like (Pac Sun, Buckle, etc.) so I guess people still drop their kids off there. It is a shame there is no movie theater. 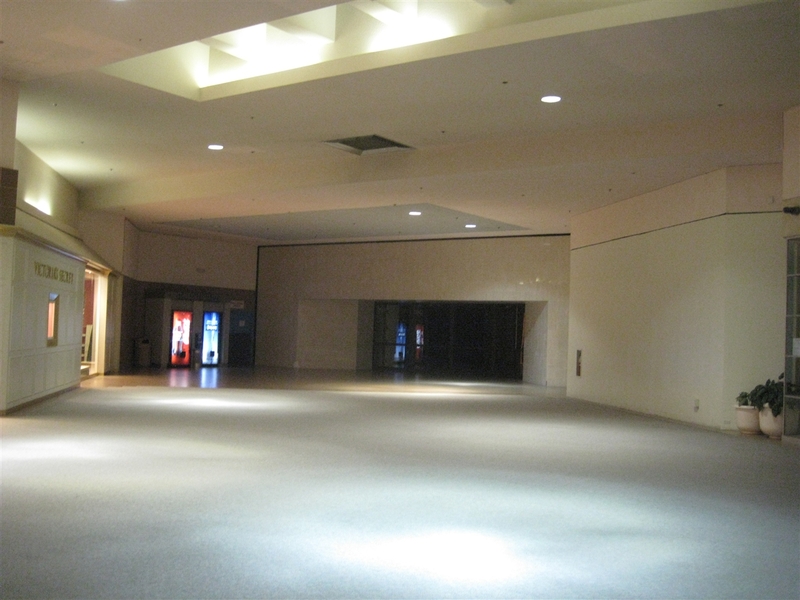 The only busy part of the mall on a Sunday afternoon was the tool department at Sears. I can’t see it surviving in any fashion. It’s all original. 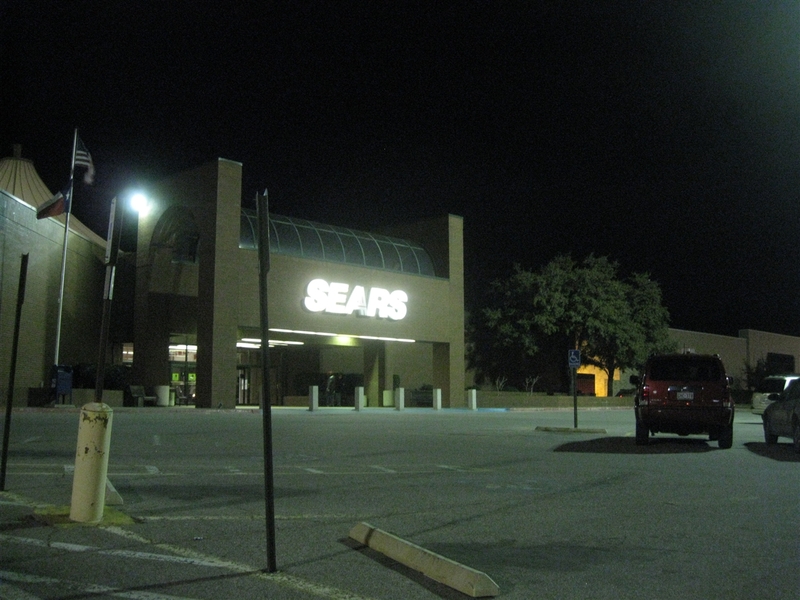 (sort-of) Before the mall was constructed, Sears was the only store there. The rest of the mall was built around them. I beleive they were in the JC penny store. Oddly enough when the mall opened for business Sears got a new but smaller store around back and JC Penny moved from the Sher-Den mall into the old Sears in front. But as for the part that looks like a 4, thats all original. 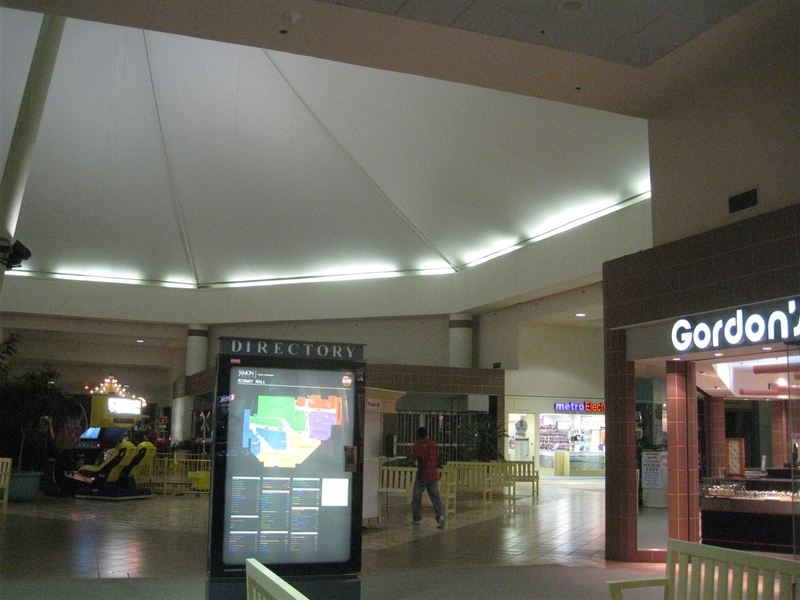 The entire mall has gone from initial construction and grand opening in 1986, to this day with absolutely no modifications or remodels of any kind, except where Goodys used to be. That store was added later. The odd tents, the green carpet, and pink paint and tile and crazy layout — all original 1986 my friend! 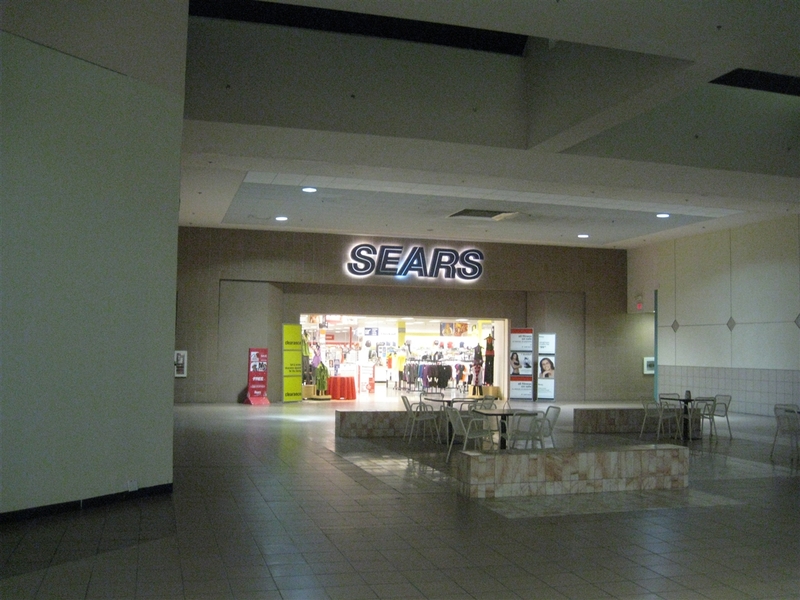 The old Sears store was demolish in 1985 to make room for Midway Mall. @Casey Jones, Ahhh. 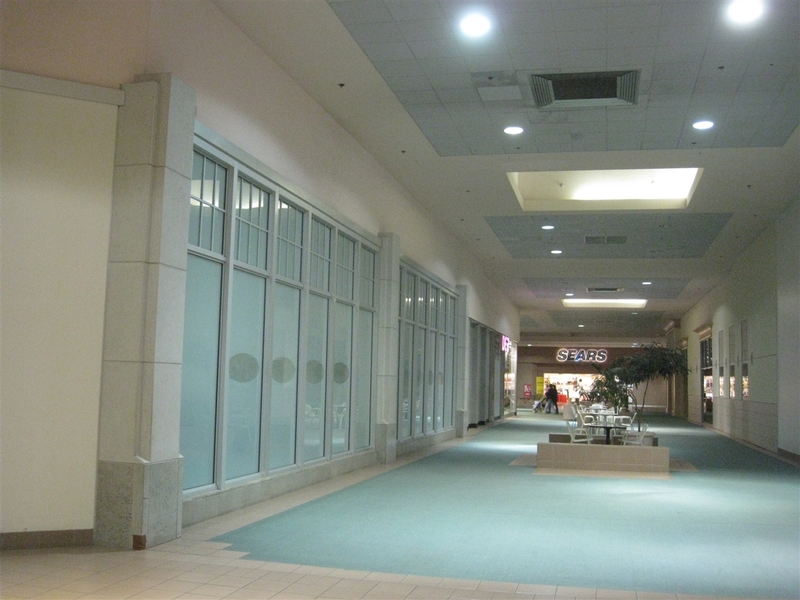 Thanks for explaining the design and square foot size as it stands today, is original to when this mall was built! 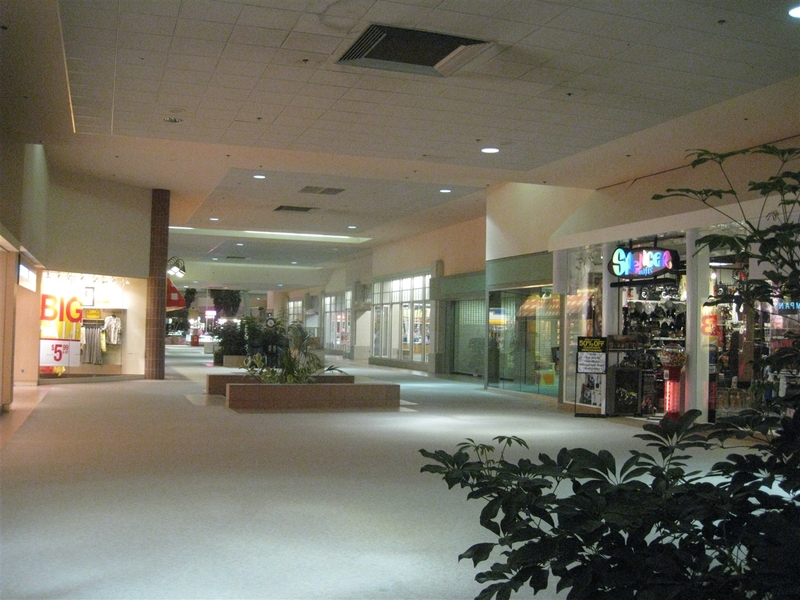 Why is this on “Death Watch” and not “Dead Malls”? 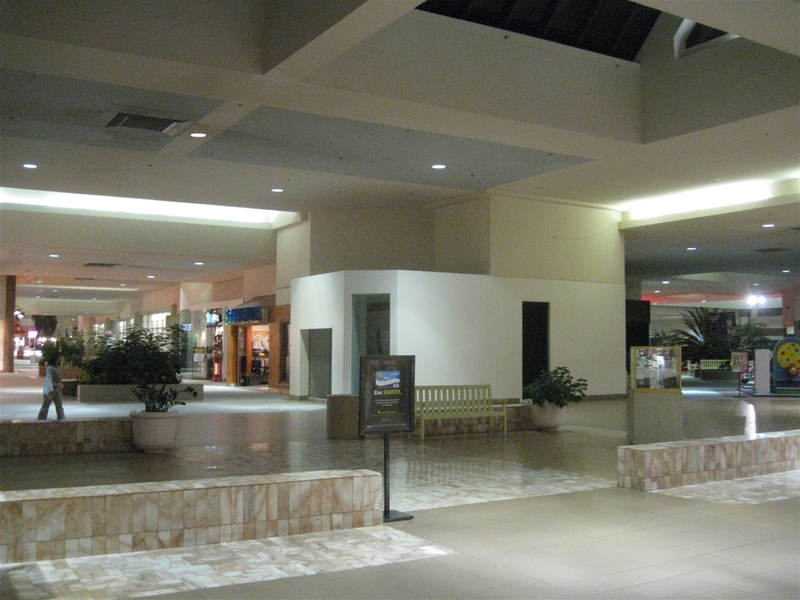 According to CBL’s website, the Midway Mall is listed on the properties page. Did Simon sell the mall to them? That’s kind of strange considering that CBL doesn’t usually deal with dying malls, with the exception of Hickory Hollow, although they’ve owned it before it started dying. Maybe they’re looking at redevelopment? although midway seems to be dying, there is a hopefull buisness man out there that believes he can breath the breath of life back to the dinly lit halls of the midway.. thomas n pham. i hear the first renovation is to be the old theatre…hopefully they choose to make a cheap seats theatre, that was my idea, i really miss the dollar theatre that they tore down in june of 2010. I myself will be back in that mall if they do! @ray, There was talk of the dollar movie there when the New Cinemark in Sherman Town Center. If anything it was the closing of the theaters and move to STC that was a fatal blow to Midway. Now I’ve worked in that mall for about 6yrs in the 90’s, during that time I was told that the mall was origionally designed to have a second floor the esclators were to be where the tents are at and every anchor store execpt for the old Goodys was designed for a second floor of course we all know that did not happen ha ha! but i also was told trough the years that the roof was never permanent because which makes since if the company was planning to add another floor, I do remember working a Chickfila when the roof to the mall caved in and flooded GAP, OldNavy, Chickfila, Dennards, and the rest of the stores that was in the shape like a 4 hall way! Man was that a nightmare! no one was hurt thank goodness! Since you worked there through the 90’s, would you happen to remember the name of the food place that sold the corn dogs and the ‘cheese on a stick’? All I remember about the look of the place was that it had a lot of yellow in the signs. Lol, please help! I grew up in the Gainesville area, about 30 mins west of Sherman on HWY 82. 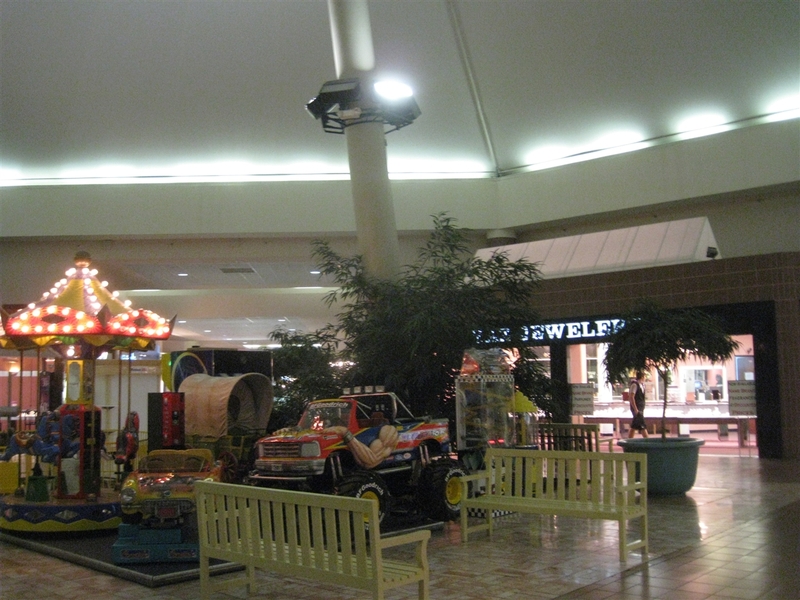 When I was little, my parents and I would sometimes visit the SherDen Mall and then the Midway Mall when it opened in the early 80s. I remember I first saw E.T. when it opened in theaters in 1982, at the SherDen Mall theater. 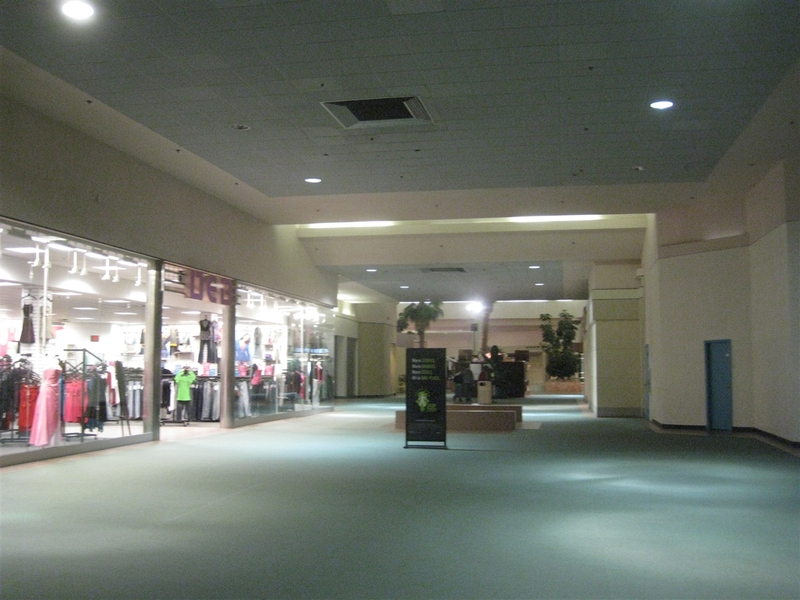 Back then, the mall had a very dark interior. Mom and Dad didn’t take me to that mall very often, which was fine with me because I always felt uncomfortable in there. 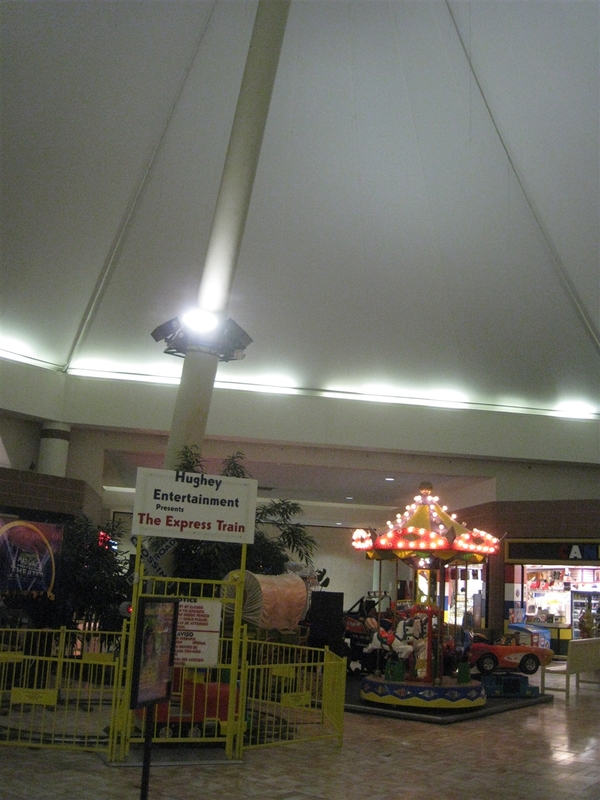 The Midway Mall really wasn’t much better in atmosphere. 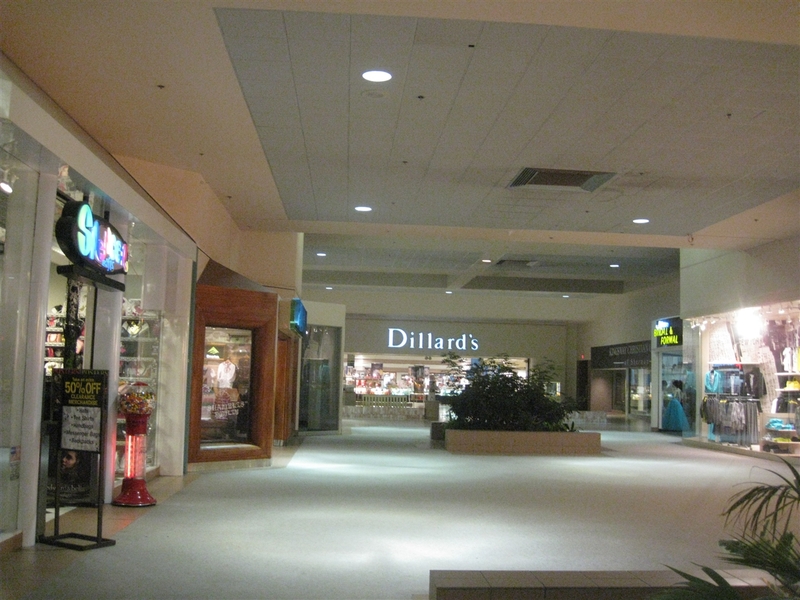 It was much larger in height, and seemingly had more stores than SherDen, but it’s very true in the description of the mall’s maze-like corridors. I live in Dallas now, and my parents live in the Sherman/Denison area. I was there with my Dad last year, but we only went into the Dillard’s, so I didn’t see the rest of the mall. 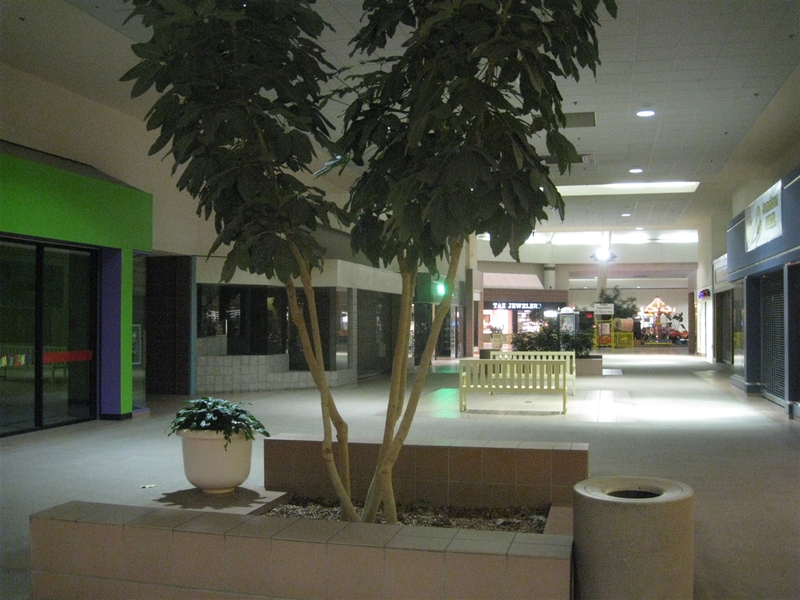 But from Dad’s description of his more recent visits, the mall was pretty much a ghost town. I predict this mall will be shut down and demolished within the next 5 years. What will be constructed in its place is anybody’s guess, though it seems that whole strip on Texoma Pkwy north of Hwy 82 has been overrun by new and used car dealerships. There was talk of the dollar movie there when the New Cinemark in Sherman Town Center. If anything it was the closing of the theaters and move to STC that was a fatal blow to Midway. 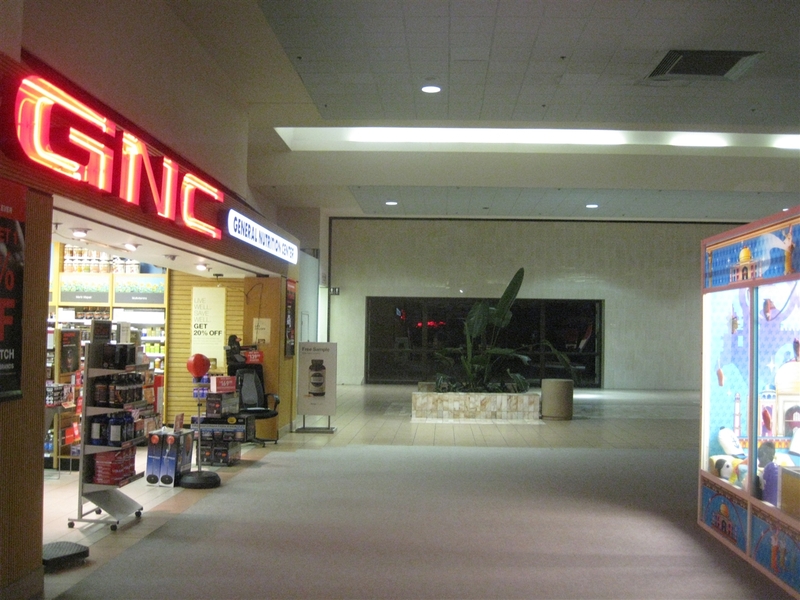 The current Mall killers have always been the easy access strip malls near Big box theaters of major thoroughfare. I have been here 15 years and good memories of the holiday times at Midway. Texoma Parkway, when I moved here, was called old 75, very confusing. I have watched the slow decay and demolition of Sher-Den and the decline of Midway. Never design almost always location. The traffic shift and new stores in a more accessible location are doing fine. Sherman has always been finicky. When a competitor comes in, one of them fails. 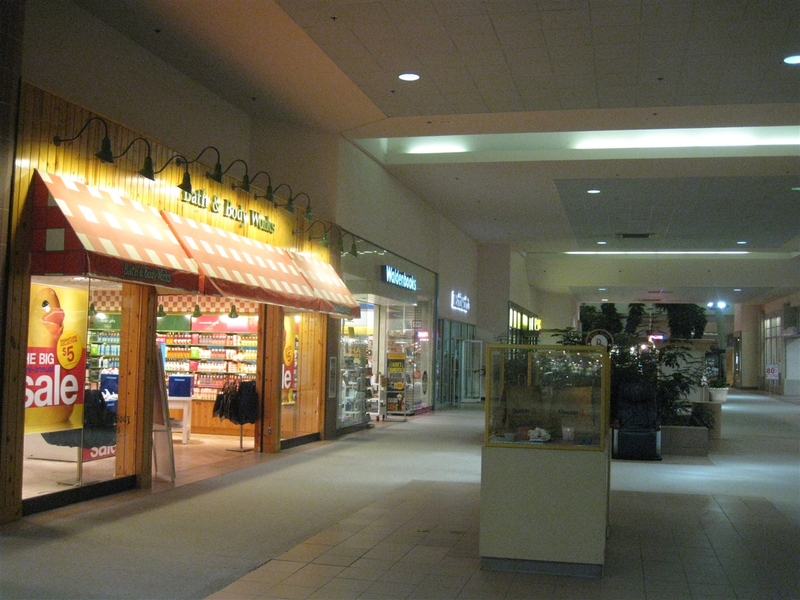 Does anyone know the name of the food place that sold the corn dogs at Midway mall? They also sold ‘cheese on a stick’ that was battered in the corn dog batter. I’m new to this area having moved here a year ago from Tulsa. I’m shocked at the ghost-town atmosphere!! It’s rather depressing. It is a shame that locals tell me this used to be “the” place to be. I guess the new Hwy. 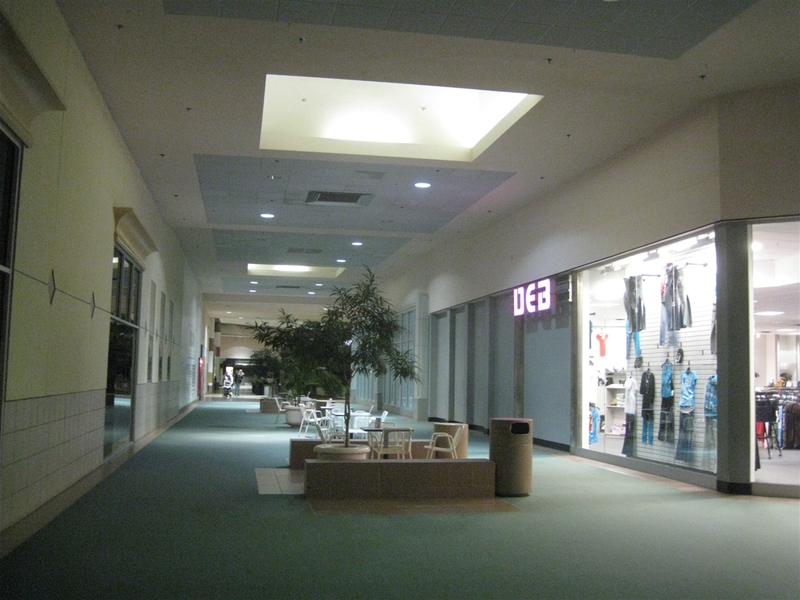 75 led the mall to it’s demise. Are there any plans or rumors of plans to attract new businesses? Add another thing to this list. Sears has just announced it is closing in September. That will just leave Dillards, Burlington, Bath and Body Works, Victoria Secret, the Buckle, GNC, a little mall movie theater and that’s about it.